Hinsdale Central senior tennis player Megan Guenther has a lifetime goal of visiting all 50 states in the U.S.
And she’s already well on her way to accomplishing that objective—around 30 so far. Guenther recently added the Carolinas during a weekend trip with her mother. At a forest preserve just across the border into South Carolina, Guenther hiked a cliff and became mesmerized. In her final season with the Red Devils, Guenther really enjoyed the unexpected. 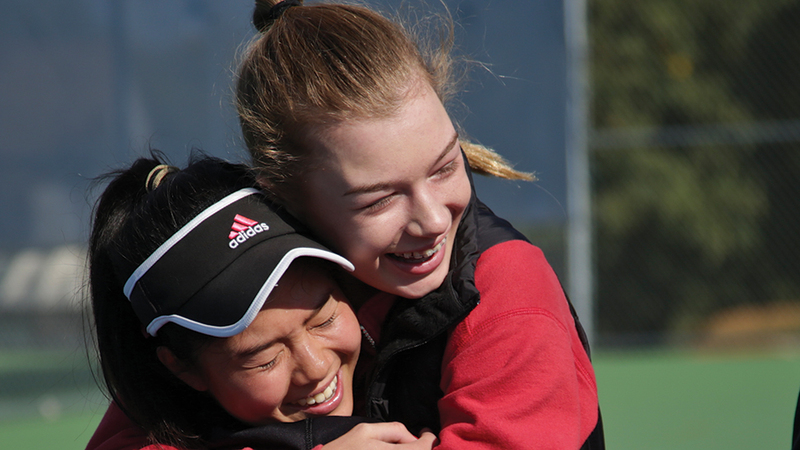 Guenther made her first trip to the state tournament and joined senior all-state veteran Erika Oku to win the Class 2A state doubles championship, helping the Red Devils capture their fourth straight team title and state-best 17th in the first year of the two-class format. Red Devils teammates Carolyn Ahn and Mira Amin were sixth in doubles, while Olivia Oosterbaan ended up tied for seventh in singles. In a battle of unbeaten pairs, Oku and Guenther (18-0) defeated Glenbrook North’s top-seeded duo of Colette and Catherine O’Regan 6-2, 6-2 in the championship. Their victory truly was historic. Oku became the 10th Hinsdale Central doubles player to claim top-eight finishes in four state meets—and the first to do it with three different partners. Guenther, meanwhile, became the first player at Hinsdale Central to win a state title in her state debut. Guenther and Oku have known each other since age 8, often playing tennis at the same clubs or against each other in USTA tournaments. The outstanding students bonded as sophomores during their Advanced Placement European history class taught by boys tennis head coach John Naisbitt. As juniors, they played doubles once, netting a victory over Oak Park-River Forest. Oku finished fourth at state with senior Danielle Burich after taking second in 2014 with junior Stephanie Dolehide and fifth with Burich in 2013. This season, Burich decided not to play high school tennis, and Dolehide played singles at sectionals. Oku and the left-handed Guenther meshed during the preseason. The duo thrived by staying calm and maintaining an upbeat outlook in matches. In 10 postseason matches, the seniors lost one set. Oku not only brought a wealth of state-meet experience, but she also owns some of the best shot-making abilities around, according to Radecki. Oku believes her sound coordination stems from her six years of playing competitive ice hockey. Oku also has played the violin since she was 4 years old and performs with the school orchestra. She recently missed a “mandatory” tennis practice to audition for the Illinois Music Educator Association orchestra. Besides hiking and running and crossing state lines, Guenther enjoys creating vases with a potter’s wheel at home. Both players plan on playing NCAA Division III tennis. Oku is considering a major in political science, while Guenther is leaning towards chemistry or earth science.